There are times when lighting can be quite magical. A good lighting scheme is one where the illumination is perfectly integrated into a space, an element of the composition that adds up to the ambience of the overall design. But there are times when the lighting becomes more playful or noticeable. It’s not being shouty – that would be the antithesis of an ideal scheme – but performing a more prominent role than usual. 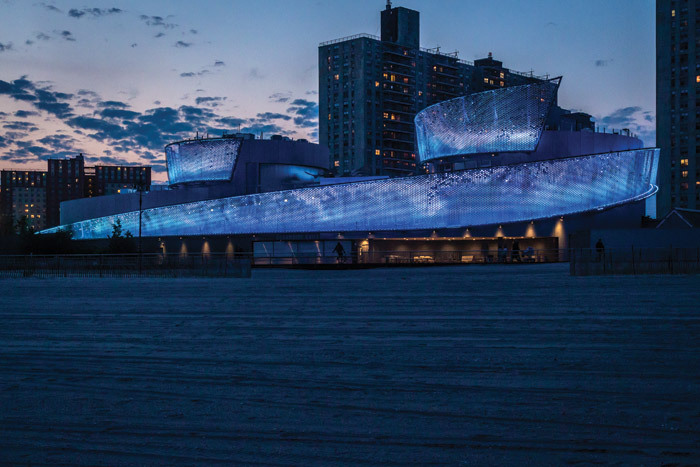 In the following examples it enables an artwork to still perform optically at night, it transforms the visitor experience at an aquarium and it makes an impressive structure spectacular when darkness falls. 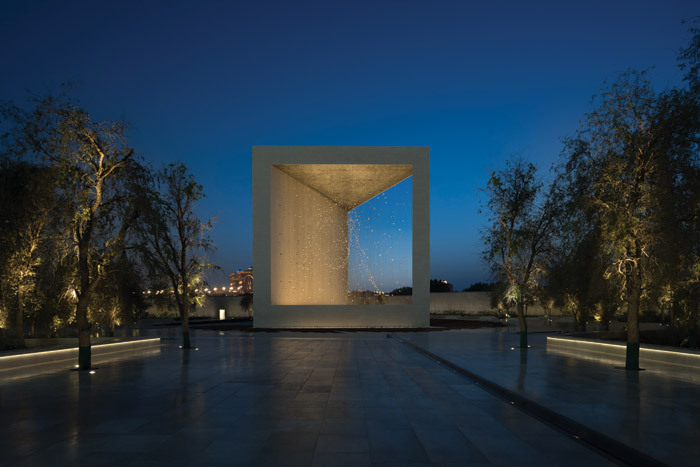 The Constellation, a monumental public artwork that forms the centrepiece of The Founder’s Memorial in Abu Dhabi, is a permanent national tribute to the UAE’s founding father, the late Sheikh Zayed bin Sultan Al Nahyan. Housed in a 30m x 30m x 30m pavilion, the 250-tonne artwork is by American artist Ralph Helmick, whose work frequently plays with optical effects. Here he uses anamorphosis, requiring the viewer to occupy a specific vantage point to reconstitute an image, in this case of Sheikh Zayed’s head. ‘The design employs a kind of “active perception” akin to how we see constellations, where we as viewers help create the image,’ says Helmick. The work comprises 1,300 geometric shapes suspended from more than 1,000 tensioned cables. The elements are varying sizes of the five types of regular, convex polyhedrons known as ‘platonic solids’, recognised for their mathematical beauty and symmetry. Clearly lighting such a complex artwork whose effect relies on vision and perception was a logistically difficult undertaking. The lighting designers collaborated closely with the artist at both his Boston studio and during the extensive lighting trials that were conducted in Abu Dhabi to achieve the optical visual performance. 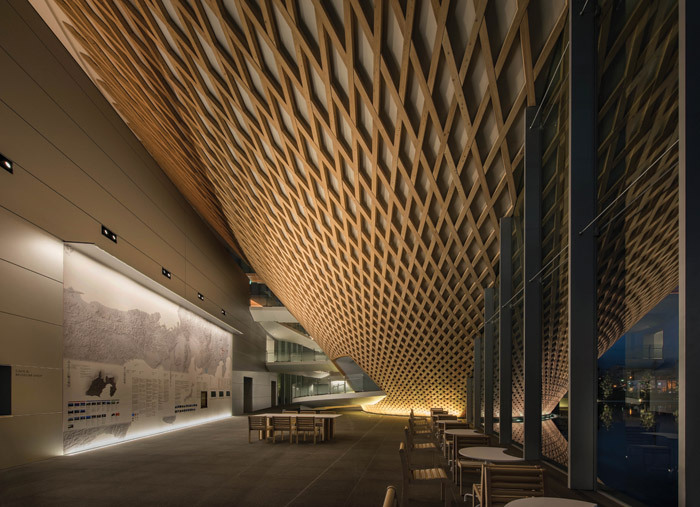 ‘Particularly challenging was the task of conceptualising and developing a lighting scheme that would highlight the unique artwork from multiple viewing angles, while retaining the subtle complexity and depth of the sculpture,’ says David McNeil, director of dpa’s Dubai studio. Following exhaustive lighting studies it was decided that multiple light sources with flexible optics and control were the best approach. This then had to be confirmed at full scale. The scheme also had to meet the additional criteria of budget, load allowance, accessibility for maintenance and, a particularly challenging aspect, solving the practical problem of getting hundreds of fixtures integrated within the fine tolerances of the structure and among the congested artwork support cables. Rarely has lighting been used quite so creatively in an office environment as here. 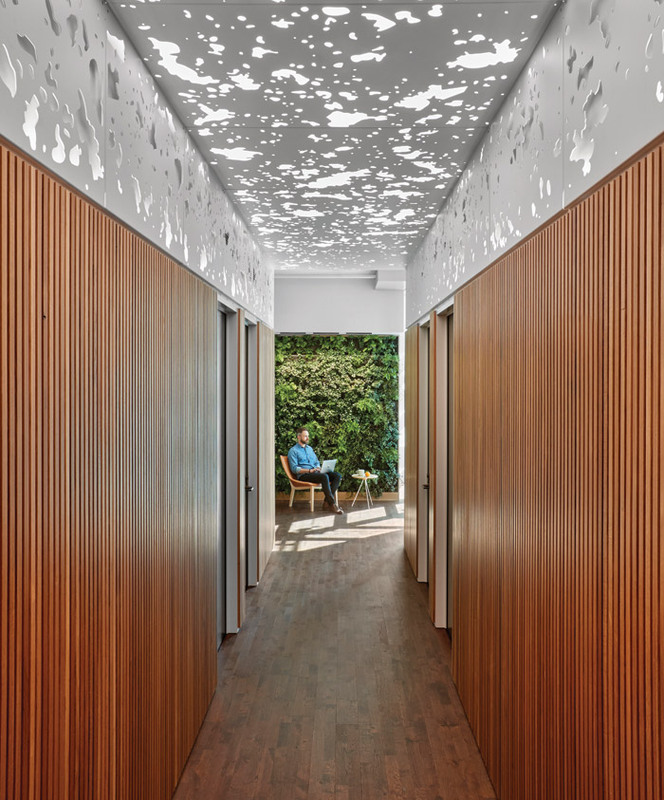 O+A’s design for the San Francisco office of business services company Slack’s is highly thematic, with each floor conveying a different part of the Pacific Crest Trail, a hiker’s paradise that stretches from the Baja Desert to the glaciers of the Northwest. The inspiration was Slack’s founder, Stewart Butterfield, a keen hiker with a particular enthusiasm for the trail. Each floor has a distinct geographical identity, which is conveyed by the materials and furniture selections, environmental graphics and, most significantly, through the lighting. ‘The lighting design for this project was perhaps the most dynamic we have ever attempted,’ says O+A. Each of these effects is paired with a meeting, work or lounge space that ‘rhymed’, as O+A puts it, with the nature of its wilderness inspiration. A ‘fairy ring’ huddle, where staff can meet informally or work alone, has lighting directly overhead, evoking a redwood fairy ring. The ‘starry night’ lounge features a dramatic cluster of ceiling-mounted tube lights, varying in length, bringing the drama of a desert night sky to what could have been a conventional meeting area. Another lounge evokes the effect of dappled light in a forest canopy, with light directed from behind apparently random holes in the ceiling splashing down on to the floor and walls. In another daylight-filled meeting space, the supplemental artificial lighting is tuned to change colour temperature throughout the day, reflecting natural patterns. ‘It subliminally suggests to a culture of workaholics that nature intends for everyone to rest,’ says O+A. In daylight, the centre by Shigeru Ban Architects is an impressive structure. The gallery element, with its timber latticework cladding, is an inverted evocation of Mount Fuji, glimpsed in the near distance. But at night its drama is ramped up by the deceptively simple lighting scheme that fully exploits both the structure of the gallery and its reflected image in the surrounding water. 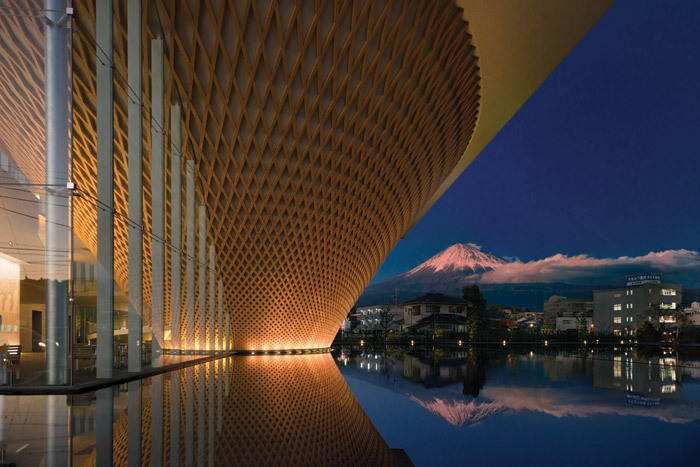 The 4,300 sq m complex is a new facility designed as a base for study and cultural activities for Mount Fuji, recently registered as a Unesco World Heritage Site. It features an observation hall offering panoramic views of the landscape. Visitors can climb a 193m spiral slope leading to the viewing tower, which the architect has designed to mimic the sensation of ascending the mountain itself. The lighting scheme is very precise, the result of extensive study into both light levels and the avoidance of light spill. The aim was just to highlight the wall of the cone without any direct spill light above the roof or to the neighbourhood. As well as the aim of creating a subtle effect, the control of light levels was important to the protection of the surrounding environment. Very few buildings in the area have facade lighting so the contrast would have been particularly marked. The structure is uplit from the base, highlighting half the height of the wall, with the illumination falling off towards the top. The illuminance of the wall surface is mostly below 5cd/sq m – half the maximum recommended level of 10cd/sq m. The fixture mounting detail and tilt angle were carefully coordinated to achieve the effect. The gallery structure broaches the glass wall, continuing the scheme into the interior. On the walkway along the site, the brightness level from the facade’s reflected light is extremely low, below one lux. 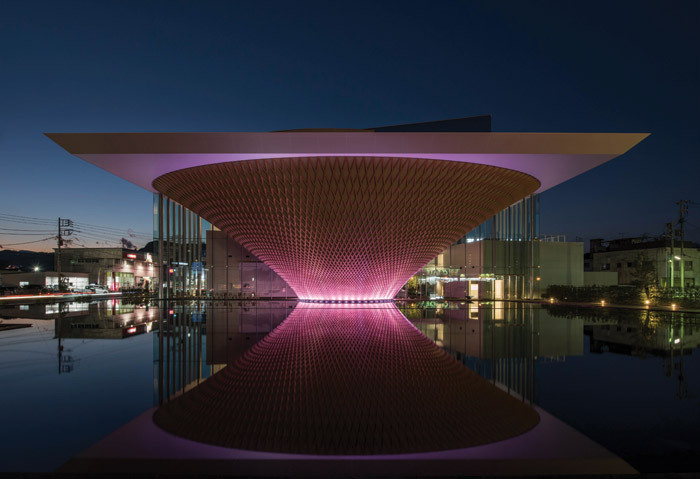 ‘This means the uplit facade surface can be seen from the walkway and it helps visitors to feel the sense of brightness more distinctly,’ says LPA. There are colour settings to reflect the seasons: cherry blossom for spring, blue for summer and a russet orange to suggest autumn foliage. The warm white light mode is particularly effective, though, suggesting the snow cap of the volcano. Light and water is an irresistible combination in any context but vital in an environment such as an aquarium, where it is not only crucial to the clear visibility of the specimens but in evoking the drama of the deep. The three-storey, 5,350-sq m exhibit building has nine galleries, and is designed to raise awareness of the importance of sharks to the health of the world’s ocean and to educate visitors about the severe threats the much-maligned animals face. It is the first exhibit that focuses on the 18 species of sharks and rays, and more than 115 other species of marine life, found in the New York Bight from Cape May to Montauk. The visitor journey begins with a 305m-long shimmering wall that uses wind and reflected light to create a mesmerising effect suggestive of ocean waves. Created by environmental artist Ned Khan, the wall comprises more than 33,000 aluminium flappers, reminiscent of fish scales, which wrap the building’s exterior. Each night, a five-hour-long lighting programme – automatically triggered as sunset over the beach approaches – illuminates the wall with a curated set of scenes inspired by ocean life. As night falls, sunlight is slowly replaced by tones of blue and purple light, ebbing and flowing in a rhythm of bioluminescent tides. Two rows of linear LED strips were installed at the base of the wall to light the flappers, held on delicate outriggers to avoid obscuring the view from below. White uplights behind the wall bounce off the swinging panels and directly into viewers’ eyes as a quick sparkle, while a row of linear LEDs in front of the wall paint the surface in vivid colours that can be seen along the boardwalk and beach. Inside, the design of the exhibit gradually takes visitors deeper into the ocean. ‘Our lighting throughout is designed to help present the natural beauty each experience is meant to evoke and create the illusion of complete immersion,’ explains principal lighting designer Brett Andersen. 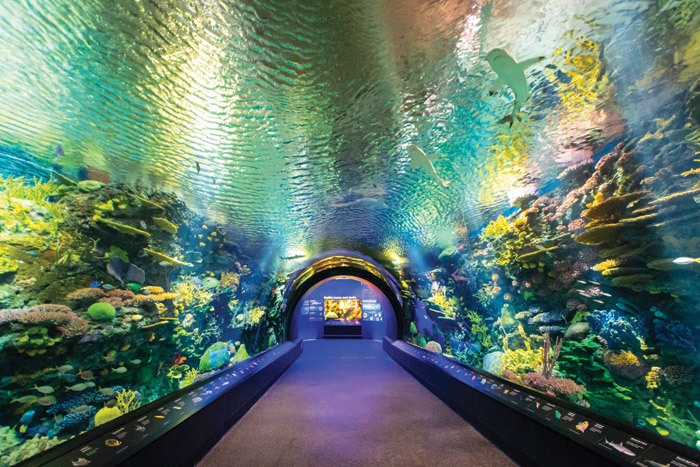 ‘We worked closely with the Wildlife Conservation Society to understand the natural lighting that occurs in the exhibit’s recreated environments, allowing the team to replicate each with artificial light sources.’ The first tank is a tunnel designed to have the look and feel of a colourful coral reef. The RGBW LED fixtures allow the lighting to be tuned to the exact colour quality needed to emphasise the coral. Other spaces, such as the exhibit’s deep ocean shark tank, Canyon’s Edge, needed a darker and more ominous feel. A few shafts of ‘sunlight’ from cool white LED spots illuminate a narrow strip of sandy bottom along the front edge of the tank, then the exhibit falls off into darkness. The deeper recesses of the huge tank are flooded with blue LED light so sharks are just barely visible in the murky depths, and then suddenly come into the light as they approach the front of the tank. The viewing area here is completely unlit so that nothing can reflect in the tank and be a distraction. As most of the light fixtures are installed above the tank, the lighting team had to find creative mounting solutions to produce the desired lighting effects. Above the entry tunnel, for instance, each light is mounted on a custom-designed trolley system. This allowed for precise fixture placement around the deeply textured coral, while mitigating sightlines into the fixtures. The system also makes maintenance easy as the fixtures can be pulled back over solid ground.